There are 125 different cards in the Dragon Ball Super Clash of Fate set - 30 commons (normal or foil version), 18 uncommons (normal or foil version), 10 rares, 6 super rares, 1 secret rare, 8 special rares, and 4 feature rares. There are 24 packs per box. 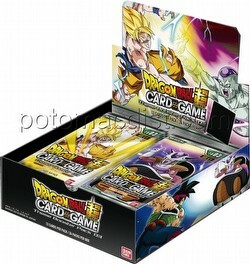 Each booster pack contains 12 cards.